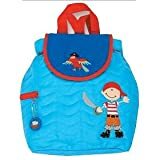 Tags: backpack, Backpack's, Boys, Cute, great, Joseph, Monogrammed, Personalized, Pirate, preschool, Quilted, Stephen, Toddler, washable. This entry was posted on Monday, November 22nd, 2010 at 9:15 pm	and is filed under Quilts for Kids. You can follow any responses to this entry through the RSS 2.0 feed. You can leave a response, or trackback from your own site.